to chemical and other environmental factors. We use 100% pure essential oils in all our products to maximize the benefits of healing hair and scalp problems. 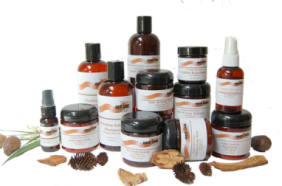 Through our holistic scalp treatment program, most scalp ailments can be cured without the use of prescription drugs. Our at home maintenance products will help keep your hair healthy and shiny between salon visits. We are committed to restoring and maintaining healthy hair and scalp. Come, explore, and learn how to achieve Great Hair…..Naturally! The Hair Care Company product line active ingredients have been chosen for their beautifying and healing properties. Natural ingredients are potent and they give lasting results that yield shining glowing, healthy hair. The Hair Care Company addresses a variety of hair concerns such as dry scalp, brittleness, breakage, and heat damage. The cure comes from the goodness of nature combined with ingredients that are all natural. The aromas will treat your senses, and the ingredients produce healthy, beautiful hair. Choosing the correct products for your hair can seem to be a daunting task. Our website can help you determine the products best suited for your hair type and recommend specialized treatments to target scalp conditions such as alopecia, dermatitis, and thinning hair. Come and experience what national and international celebrities have known for years. You too can have and maintain beautiful hair through regular salon visits, a healthy diet, and most importantly, using all natural hair care products. “Attempting to be more conscious of what I put in my body and products I used, especially in my hair, brought me to The Hair Care Company. I had been looking for a stylist who could repair my damaged hair and help point me in the right direction of products that were both healthy and effective. I was very excited to find out that they had their own naturally made products that could be used on every type of hair. I bought a number of products from The Hair Care Company including the Problem Solver Shampoo, Instant Daily Conditioner, and Liquid Shimmer just to name a few.